Many members have asked us how the Tax Cuts and Jobs Act of 2017 (TCJA) bill passed last year will affect both private equity (PE) firms and lenders. Recently, PitchBook (a Morningstar company) released a comprehensive article on the topic. Below are some highlights from the article and Alliance Partners’ response with how the points impact us as lenders. Please contact your client services representative or email clientservices@alliancepartners.com if you would like access to the full article. The TCJA was the largest overhaul of the U.S. tax code in decades. Regarding PE portfolio companies, there are certainly some negatives in the bill, but most industry professionals believe the TCJA is a net positive for PE firms, a sentiment with which PitchBook largely agrees. The changes impact general partners (GPs), limited partners (LPs) and portfolio companies; but each sector will see different levels of benefits. Some may see no benefits at all. Every case is unique and depends on strategy, deal structure, hold time and more. PB: Many PE firms will limit leverage to 6-7x EBITDA because interest deductibility is now capped at 30% of EBITDA, effectively increasing the after-tax cost of debt as leverage rises. As such, if a company’s leverage is above the 6-7x range, net tax payments will be higher under the new tax law compared to the old regime. AP: This will have an impact on the larger, broadly syndicated market but should have minimal impact on the core and lower- middle market. Leverage in the middle market space has generally been contained by the Leveraged Lending Guidance of 2013, although there has been some pressure upwards over the past several years. For context, the Leveraged Commentary & Data (LCD – a Standard & Poor’s service) Middle Market Review had average Senior and Total leverage multiples of 4.83x and 5.54x, respectively for loans funded in Q1 2018. The LCD Senior and Total leverage quarterly review for large corporate Loans had average Senior and Total Leverage multiples of 4.72x and 5.93x, respectively for loans funded in Q1 2018. Furthermore, certain industries that heavily rely on more leverage (healthcare, B2B, technology) due to their stable economics and cash flows will be impacted more than cyclical industries (auto, chemicals, manufacturing). However, we expect the interest deduction impact to be minimal. An analysis by Bain & Company showed that the capping of interested deductions reduced private equity IRRs by 0.2% . Additionally, analysis by Hamilton Lane shows that the benefits of tax reform begin to diminish with debt at 5x EBITDA and only companies with leverage of 7.5x EBITDA will actually see a net tax increase. Lastly, there are other deductions private equity firms can take to lower annual tax payments (see below). PB: We expect an increase in asset acquisitions because new capital expenditure (CAPEX) rules allow for certain new and used asset purchases to be expensed at 100%, giving companies an immediate tax savings for investing themselves. AP: This will occur on a deal by deal basis. AP will monitor and factor in tax savings in its cash flow analysis. PB: Large conglomerates will be more willing to do carve-outs and divestitures because their tax payments will have dropped by 40%, which will lead to more opportunities for PE firms. AP: This is a positive, as it will potentially allow for the sale of more quality assets. As with analysis for acquisitions of most carve-outs, lenders will typically rely on a quality of earnings report as the audit of the large corporate entity does not give insight into the subsidiary on a stand-alone basis. PB: PE firms will be more open to international expansion and add-ons because of the changes from a worldwide tax system to a territorial system, reducing foreign taxes on most PE platform companies. AP: Generally this is a net positive as this will allow private equity firms to pursue higher cash yielding strategies. As with all international exposure, AP will continue to monitor foreign exchange risk and repatriation risk. Furthermore, structuring of the credit agreement will need to ensure that any acquired foreign subsidiaries that provide a stock pledge do not trigger unforeseen tax consequences. PB: The timing and impact of tax changes will be beneficial for CAPEX-intensive companies, though the benefits will last only five to six years as the interest deductibility is further reduced to 30% of EBIT in 2022 and the bonus CAPEX expensing begins to trail off in 2023. AP: This change will have limited impact as most private equity firms look to invest in “Asset Lite” business models in order to maximize cash flow. AP will monitor and factor in tax savings in its cash flow analysis. PB: More PE firms will choose C-Corp structures as opposed to flow-through entities (aka pass-through entities) for their portfolio companies because of the reduced U.S. corporate tax rate and C-Corps’ relatively favorable international tax treatment. AP: We have not seen this impact as of yet and it remains to be seen if there will be a shift. There are many considerations that go into how portfolio companies are structured. This includes the 20% flow through reduction of partnerships, LP composition (i.e. foreign and tax exempt U.S. investors), foreign income sources, tax cost and complexity of companies, and the cash distribution philosophy of the sponsor. AP will continue to monitor and factor in the tax structure in its cash flow analysis. PB: We expect fewer exits to occur in less than three years due to the changes in carried interest taxation requiring a three-year hold period to realize long-term capital gains rates on the carry. These quick exits represented only 16.9% of exits in 2017, and we expect that number to further decrease. AP: Both AP and PitchBook believe the changes made to carried interest will have very little impact on the PE industry. 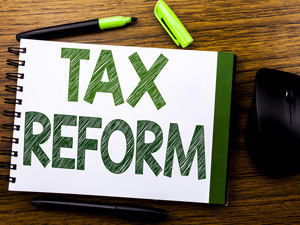 Though carried interest generated many headlines leading up to the signing of TCJA, the changes incorporated into the final legislation were relatively minor. An investment must now be held for at least three years to realize long-term capital gains rates. While this timeframe extension is a negative for PE, the trend has been to hold portfolio companies longer. In fact, PitchBook data shows that only 16.9% of exits in 2017 were completed in under three years. As lenders, we view this as a positive and a chance to see additional lending opportunities with existing Borrowers via incremental facilities.